Somewhat less common methods of achieving wireless communications include the use of other electromagnetic wireless technologies, such as light, magnetic, or electric fields or the use of sound. 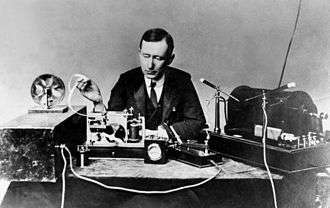 The term wireless has been used twice in communications history, with slightly different meaning. It was initially used from about 1890 for the first radio transmitting and receiving technology, as in wireless telegraphy, until the new word radio replaced it around 1920. The term was revived in the 1980s and 1990s mainly to distinguish digital devices that communicate without wires, such as the examples listed in the previous paragraph, from those that require wires or cables. This is its primary usage in the 2000s. LTE, LTE-Advanced, Wi-Fi and Bluetooth are common modern wireless technologies used in the 2000s. The Edison system was used by stranded trains during during the Great Blizzard of 1888 and earth conductive systems found limited use between trenches during World War I buy these systems were never successful economically. Electromagnetic induction short range communication and power. This has been used in biomedical situations such as pacemakers, as well as for short-range Rfid tags. Light, colors, AM and FM radio, and electronic devices make use of the electromagnetic spectrum. The frequencies of the radio spectrum that are available for use for communication are treated as a public resource and are regulated by national organizations such as the Federal Communications Commission in the USA, or Ofcom in the United Kingdom. This determines which frequency ranges can be used for what purpose and by whom. In the absence of such control or alternative arrangements such as a privatized electromagnetic spectrum, chaos might result if, for example, airlines did not have specific frequencies to work under and an amateur radio operator were interfering with the pilot's ability to land an aircraft. Wireless communication spans the spectrum from 9 kHz to 300 GHz. One of the best-known examples of wireless technology is the mobile phone, also known as a cellular phone, with more than 4.6 billion mobile cellular subscriptions worldwide as of the end of 2010. These wireless phones use radio waves from signal-transmission towers to enable their users to make phone calls from many locations worldwide. 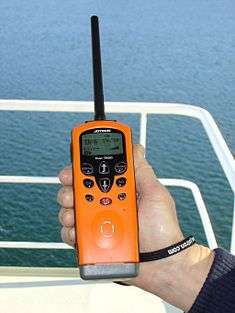 They can be used within range of the mobile telephone site used to house the equipment required to transmit and receive the radio signals from these instruments. Wi-Fi is a wireless local area network that enables portable computing devices to connect easily with other devices, peripheries, and the Internet. Standardized as IEEE 802.11 a,b,g,n, Wi-Fi approaches speeds of some types of wired Ethernet. Wi-Fi has become the de facto standard for access in private homes, within offices, and at public hotspots. Some businesses charge customers a monthly fee for service, while others have begun offering it for free in an effort to increase the sales of their goods. Cellular data service offers coverage within a range of 10-15 miles from the nearest cell site. Speeds have increased as technologies have evolved, from earlier technologies such as GSM, CDMA and GPRS, to 3G networks such as W-CDMA, EDGE or CDMA2000. Wireless data communications are used to span a distance beyond the capabilities of typical cabling in point-to-point communication or point-to-multipoint communication, to provide a backup communications link in case of normal network failure, to link portable or temporary workstations, to overcome situations where normal cabling is difficult or financially impractical, or to remotely connect mobile users or networks. Wireless energy transfer is a process whereby electrical energy is transmitted from a power source to an electrical load (Computer Load) that does not have a built-in power source, without the use of interconnecting wires. There are two different fundamental methods for wireless energy transfer. They can be transferred using either far-field methods that involve beaming power/lasers, radio or microwave transmissions or near-field using induction. Both methods utilize electromagnetism and magnetic fields. ↑ Franconi, N. G.; Bunger, A; Sejdic, E; Mickle, M. H. (2014). "Wireless Communication in Oil and Gas Wells". Energy Technology. 2: 996–1005. doi:10.1002/ente.201402067.